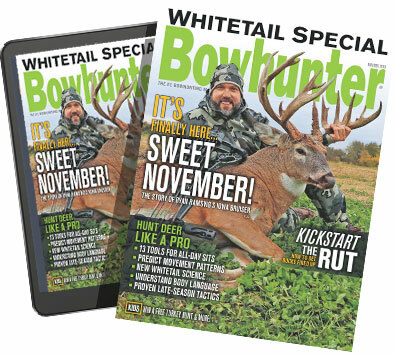 Every time I hear someone say that the late-season is the best time to bowhunt, I throw up a little in my mouth. This visceral reaction happens for one main reason, which is basically that anyone who would utter that line is clearly hunting in a world most of us aren’t. They’re usually the title holder to 1,000 acres of southern Iowa deer ground or have dumped a year’s worth of college tuition into a primo deer lease. 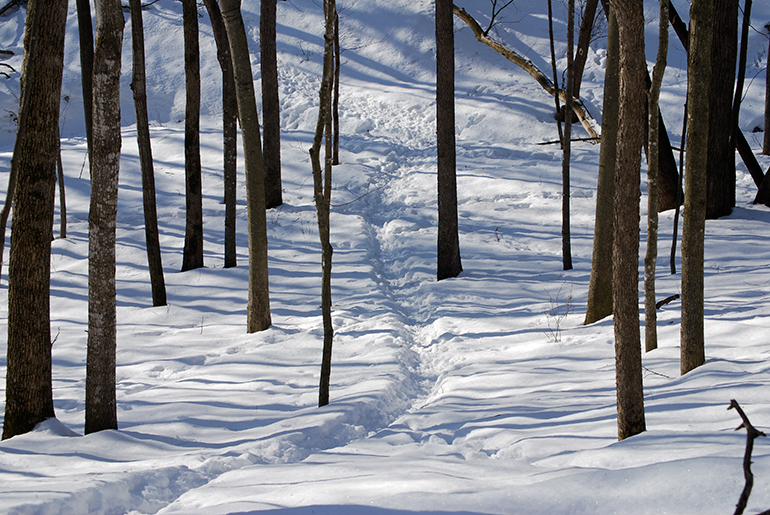 Sure, if you have unreal deer hunting to begin with, the late season is probably pretty sweet. If you’re hunting where there has been some level of hunting pressure throughout the fall, the late season is something else entirely. It’s tough. It gets tougher if you’re on a property that doesn’t have a killer food source to concentrate deer movement. It’s pretty doomy and gloomy out there, but not all hope is lost. You can enjoy some snowy sits provided you go in with the right attitude and realistic expectations. I’m not a hit-list guy to begin with, and when it comes to trying to fill any December deer tag, I’m really not picky. The reason for this is simple - if I set my sights on a mature buck where I hunt, it would never happen in December. I’d never see one, most likely. So, I just hunt deer. Any deer. 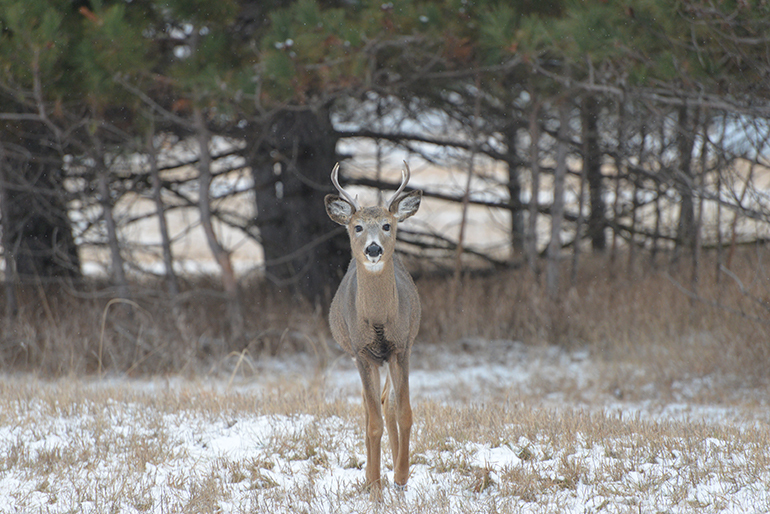 If you bowhunt pressured ground, forget the hitlists and the mature bucks during the late-season and just hunt deer. Any deer. You might want to as well. If you can stand not having a monster buck to post on Instagram and just want to enjoy your time in the woods and maybe end up with 35 pounds of delicious venison, then hunt whatever deer are available to you. This involves an attitude adjustment to some extent. But one thing I’ve noticed when I go full-on if-it’s-brown-it’s-down is that I really enjoy every single deer encounter, because they all become potential target deer. Like the lonely drunk guy at the bar with zero standards when it comes to potential mates, you’re ready to hit the woods in search of any deer. 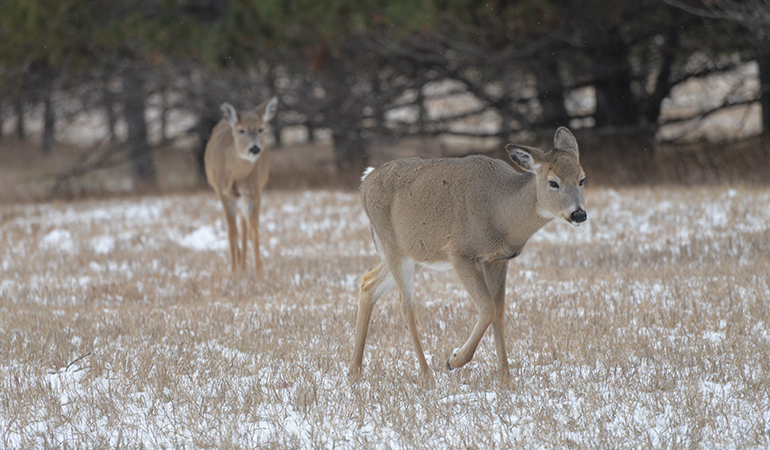 This sounds easy, but even the fawns this time of year have had enough of hunters’ BS. If you’re scrounging around on public land like I am, you won’t encounter any hoofed idiots. Bowhunting the late-season requires some scouting and a willingness to try out new setups along the routes deer are using right now. You’ll need to scout, which means that hopefully you’ve got some fresh snow with which to expedite your fact-finding missions. If not, don’t fret. Your job won’t be easier, but either way, you’ve got to find where the deer are traveling right now and get in there to set up when the conditions are right. In that regard, it’s the same strategy that rewards hunters on pressured ground during the earlier months of the season. If you have the chance to combine in-cover scouting with a bit of long-distance glassing, do that. Deer are highly visible in the late-season, and watching how they approach a food or travel through the woods is extremely valuable because like the early-season, the routes they take today will often be the routes they take every day for weeks until they get bumped off of them. We all know that comfort is king in the late season. If you’re not comfortable, you’re not going to fill tags. There are plenty of options for quality layering systems and outer shells that block wind, which are all solid choices. Lately, because I hunt in Minnesota and Wisconsin, I’ve explored some of the body suit options available. I’ve hunted when the temperatures never rose to zero degrees, and quite frankly, I’m sick of being cold. The best I’ve found so far is the suit from Blizzard Buddy because it was actually designed with the bowhunter in mind. That matters a lot because it’s not simply a repurposed sleeping bag. 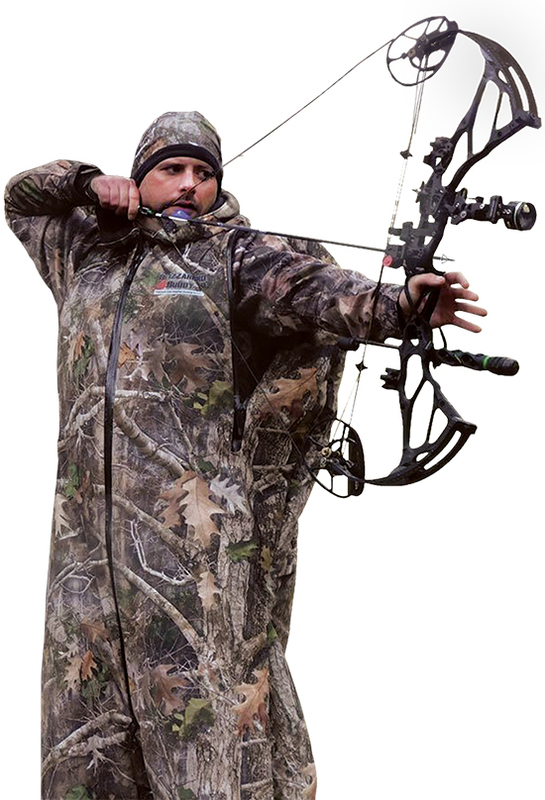 Blizzard Buddy’s suit is super warm but allows freedom to use your arms, which is pretty important if you need to shoot a bow. If you’re going to hunt when it’s cold, figure out how to stay warm first before you address any of your other gear. 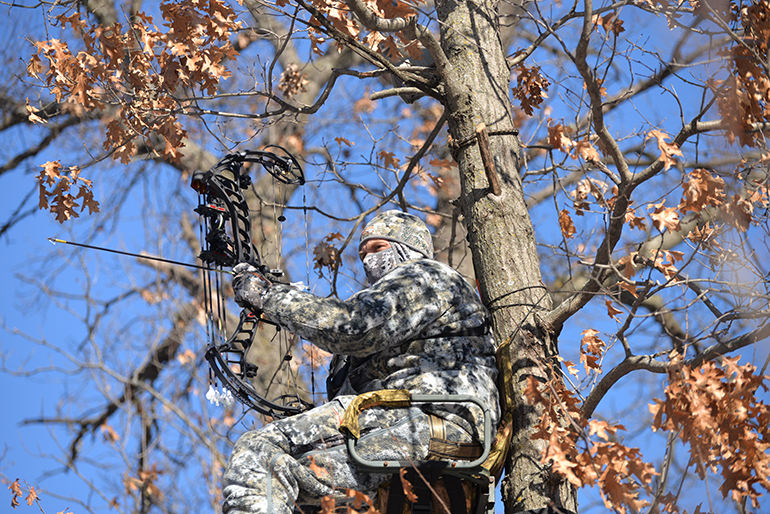 Let’s say you’ve scouted a bit, hung a stand where the deer are cruising, and have figured out a way to not get frostbite. You’ll still need the motivation to hunt, which can be hard to come by when it’s ice-fishing season. The way I do this is to remember that I never regret going hunting. Ever. It can be hard to work up the desire to bowhunt the worst part of the season, but you won’t regret climbing into a stand if you’ve done your homework and set up on current deer activity. I never regret waking up super early and walking into the woods, just as I never regret spending three hours in a stand watching a winter wonderland and hoping a delicious doe walks through. Psych yourself up however you need to, but remember, you won’t regret it if you go hunting.